LaLicious is a delectable line of body products that includes all-natural body soufflé scrubs andbody oils, paraben free products including paraben free moisturizers and body soaps. All of our paraben free skin products come in eight scrumptious scents including: Brown Sugar & Vanilla, Coconut Cream, Lily Mango, Passionfruit Lime, Island Guava, Tahitian Flower, Peppermint and Coffee Bean. 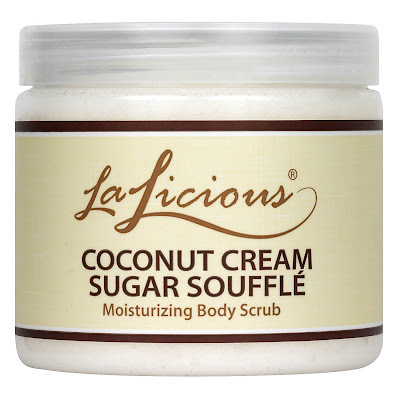 LaLicious Sugar Soufflé Scrubs maintain their form from creation to application using natural ingredients and a special whipped technique. Coconut and almond oil provide minerals, vitamins and proteins that are essential for beautiful skin. The oils also penetrate skin easily while locking in moisture without leaving a greasy feeling. Almond oil in particular, relieves itching, dryness, inflammation, burns and thread veins. Vitamin E oil soothes and conditions as the honey helps soften. Last but not least, Pure Cane Sugar is a less abrasive exfoliant than salt- it won't sting cuts on the skin. With the perfect combination of ingredients LaLicious helps exfoliate, condition, moisturize and smooth you to perfection! LaLicious paraben free skincare products are everything your body craves and deserves! This natural body scrub is made with coconut oil which absorbs quickly and easily into your skin, leaving it moisturized and protected without feeling greasy. Pure cane sugar crystals exfoliate dead skin cells while sweet almond and vitamin-e oils condition, moisturize, and smooth you to perfection! This all-natural sugar scrub is a highly moisturizing body exfoliator. Before you get out of the shower, scrub all over your body and rinse with warm water. Pat yourself dry and the tropical scent of coconut will have you daydreaming for hours! No need for lotion after using this scrub in the shower. Just get out and go! Rinse the sugar crystals away and you have the perfect opportunity to get the closest shave ever! Your legs will be moisturized and silky smooth! *To keep this product looking and smelling its best, keep the lid on tight and store at room temperature. Now PARABEN FREE! This body cream is a Shea Butter base. Renowned for its therapeutic and healing properties, Shea Butter is the ideal moisturizing ingredient! Our whipped consistency allows for intense hydration without leaving your skin feeling greasy. Aloe is added to help heal dry, damaged skin. This fresh-squeezed lime scented body cream is enriched with Shea Butter which seals in moisture keeping your skin soft throughout the day. Scoop out with your fingers and smooth all over skin. Use as often as desired for an intense hydrating effect. Keep LaLicious Body Butter on your desk, by your bed, or in the car to keep your skin glistening no matter where life takes you! 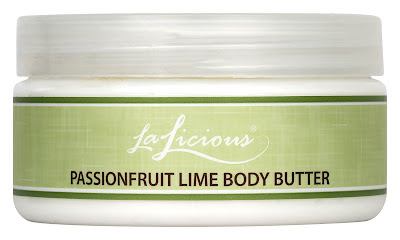 OOO that body butter sound delish! :) You know I'm a sucker for those!